The Lady Muckers basketball team stumbled at the Wells Rural Electric Tournament but shows some promise for future games. This was the first test of the season to find out the kind of team the Muckers had. On the first day of the tourney, the team got a big victory against Carlin by a score of 51-40 (Thursday), and then dropped two games against Eureka (55-30) and Jackpot (63-59) on Friday. The Saturday game against Wells was canceled due to inclement weather. Before taking the court for the first time in months, Muckers Coach Russell Olin told the girls to enjoy the game. Senior player Ashley Gray took the coach’s words to heart. “I took Mr. Olin’s advice, and had fun. This tournament is always a learning experience on and off the court. But knowing that this is the start of my last basketball season, I went out and played hard and enjoyed the time with my teammates,” Gray said. Olin said his girls worked hard and showed improvement. “We had one win and two losses. We had balanced scoring, with points coming from inside the paint and from the outside. The girls played hard, and are willing to do whatever they can to help the team. Their goal is to work hard at improving during the week, and show it on game days,” he explained. Olin said that the girls know that they can play better and they are committed to prove it. Gray agrees with her coach and is completely confident in her team as well. “We played well together, we had a few errors but it’s nothing we can’t fix,” she said. According to the coach, the squad needs to improve their free throw shooting and also “do a better job of dribbling with their heads up because our players missed girls who were wide open, and threw some bad passes because they didn’t see the defense,” he said. Against Eureka, Olin’s team committed a lot of unforced turnovers. “In my opinion we need to control our turnovers, and control the pace of the game,” Gray said. The team has time to work on their issues before the next game, which is in two weeks. Gray was one of the key players of the tournament. “Offensively I enjoy clearing the lane for my teammates to get a better shot. And defensively I enjoy rebounding, because I can fight for the ball,” the senior explained. Olin believes Gray to be his power player. 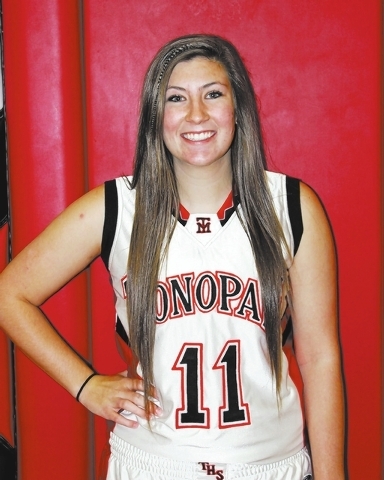 “She proved she could be a dominant player both on offense and defense. 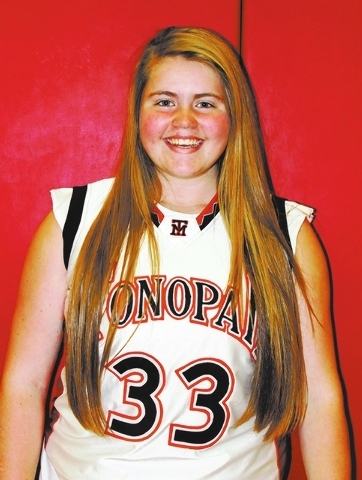 She averaged a double-double for the weekend,” Olin said. Gray was definitely not the only player who deserves recognition. Experienced players like Julia Klapper also led the Muckers in the contest. According to Olin, Klapper had a solid three games and he feels confident that she will have a great season. Olin will also rely on senior Elise Salsbury. “She is a smart player and knows the game well, the injury from her accident didn’t stop her from succeeding,” he said. In addition, he said sophomore Ally Otero showed a lot of promise scoring well and making some great passes. Likewise, Maddi North worked hard on defense causing several turnovers. Kathy Swafford proved she could be a leader at point guard and Cheyenne Torres came off the bench, and her energy sparked the team. Olin’s squad showed their capacity to react, mainly in the last clash of the tournament. “Our game against Jackpot really showed that this team won’t give up. We were down 10 points with two minutes left and we were able to fight back and cut the lead to four. We lost the game but not one person gave up,” Gray said.